Currency Converter: U.S. dollar - approx. 11.70Argentine peso - approx. 165Australian dollar - approx. 15.10Bahamian dollar - approx. 11.70Brazilian real - approx. 42.09CFA franc - approx. 6,777CFP franc - approx. 1,233Chilean peso - approx. 7,771Chinese renminbi - approx. 75.75Colombian peso - approx. 35,105Croatian kuna - approx. 77.59Czech Republic koruna - approx. 279Danish krone - approx. 76.87East Caribbean dollar - approx. 31.47European Euro - approx. 10.33Fiji dollar - approx. 24.14Ghanaian cedi - approx. 44.80Guatemalan quetzal - approx. 92.08Honduran lempira - approx. 263Hong Kong dollar - approx. 90.72Hungarian forint - approx. 3,216Icelandic krona - approx. 1,448Indian rupee - approx. 777Indonesian rupiah - approx. 154,536Israeli new shekel - approx. 44.18Jamaican dollar - approx. 1,428Japanese yen - approx. 1,274Malaysian ringgit - approx. 45.94Mexican peso - approx. 204Moroccan dirham - approx. 113.13Myanmar kyat - approx. 13,752Neth. Antilles guilder - approx. 20.82New Zealand dollar - approx. 16.84Norwegian krone - approx. 96.09Pakistan rupee - approx. 1,226Panamanian balboa - approx. 11.70Peruvian new sol - approx. 38.29Philippine peso - approx. 540Polish zloty - approx. 44.53Romanian new leu - approx. 46.25Russian ruble - approx. 775Serbian dinar - approx. 1,271Singapore dollar - approx. 15.82South African rand - approx. 170South Korean won - approx. 13,396Sri Lanka rupee - approx. 1,699Swedish krona - approx. 94.99Swiss franc - approx. 11.27Taiwanese new dollar - approx. 378Thai baht - approx. 409Trinidad and Tobago dollar - approx. 77.19Tunisian dinar - approx. 23.52Turkish lira - approx. 33.26U.A.E. dirham - approx. 42.96U.K. pound sterling - approx. 8.20Venezuelan bolivar fuerte - approx. 116.93Vietnamese dong - approx. 262,982 * Exchange rates shown above are estimates only, and may vary slightly from the rates charged by PayPal or your Credit Card Company. 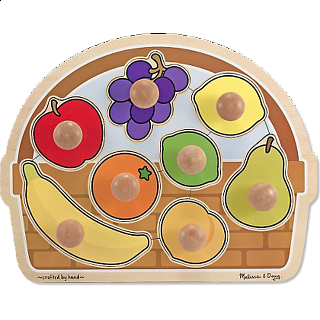 This extra-thick wooden puzzle includes eight colorful, fruit-shaped pieces, each with a jumbo wooden knob that is easy for toddlers to grasp. Full-color, matching pictures appear underneath each piece. 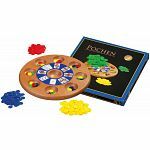 A perfect puzzle for one-year-olds as they develop hand-eye coordination, fine motor skills, visual perception skills and beginning vocabulary! People who purchased Fruit Basket - Large Jumbo Knob also purchased the following puzzles. 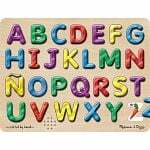 I bought this puzzle for my nephew and he loved it, five stars!! !